If you’ve ever watched a sunrise or sunset, you’ve seen how the Sun appears deep orange, or even red when low in the sky. In the middle of the day the Sun appears merely yellow. So why does it appear different colors at different times of the day? The answer lies in how light interacts with our atmosphere. 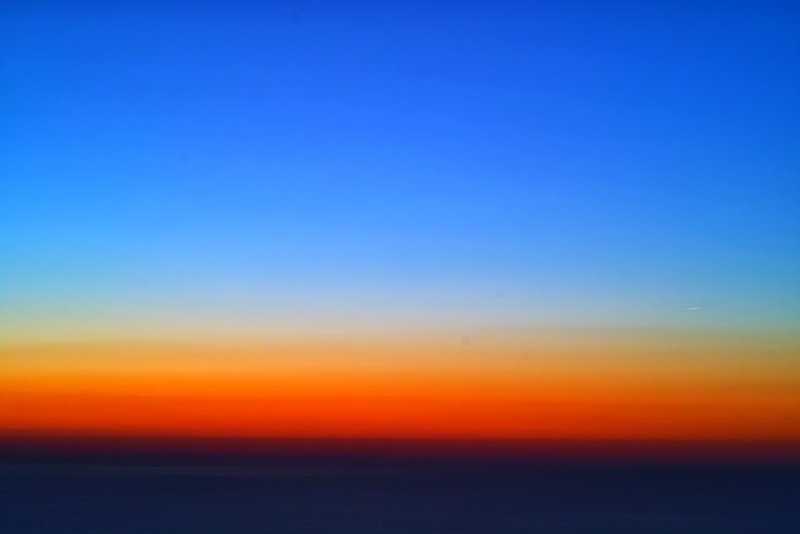 Light interacts with our atmosphere in a number of ways, but one of the dominant interactions is a type of scattering known as Rayleigh scattering. You can think this scattering as a collision between two billiard balls, but instead of billiard balls you have a photon and an air molecule. The one thing the billiard balls have in common with Rayleigh scattering is that a billiard collision is elastic. This means none (or not much) of the energy is absorbed or lost during the collision. When two billiards collide the energy they had before colliding is the same as after. They just scatter off each other and go along their merry way. Rayleigh scattering is also elastic, so the photon and air molecule don’t lose energy when they scatter. This is important, because the energy of a photon depends upon its wavelength (or color). So the fact that Rayleigh scattering is elastic means it doesn’t change the color of the light being scattered. Red light scatters off the molecule as red light, and blue light scatters as blue light. But a photon is not a billiard ball. While it can be useful to visualize photons as tiny particles as light, they are not really particles in the way we typically think of particles. Instead they are quantum particles or quanta. This means that while they have particle-like properties, they also have wave-like properties. As I mentioned earlier, the energy of a photon depends on its wavelength, which is a property of waves. In Rayleigh scattering, this quantum effect comes into play in a big way. Rayleigh scattering occurs when the object photon scatters off (the air molecule) is much smaller than the wavelength of the photon. The closer the wavelength is to the size of the molecule, the more likely it is to scatter. This means that red wavelengths (which are the longer wavelengths of visible light) don’t scatter with air molecules much, while blue wavelengths (which are shorter) tend to scatter a lot. In fact blue light is almost 10 times more likely to scatter against air molecules than red light. When the Sun is low in the sky, it’s light has to travel a long path through the atmosphere to reach you. As the light travels through the atmosphere some of the photons are scattered off the air molecules. When the photons scatter off air molecules, they scatter randomly in all directions, so usually when a photon scatters, it scatters away from your line of sight. Since blue photons scatter much more often than red ones, much of the blue light is scattered away. This leaves red photons to reach your eye. Hence the Sun looks red when low in the sky. When the Sun is overhead, the path it takes to reach you is much shorter, so only a bit of the blue light is scattered. So the Sun looks yellow. This effect also explains why a full moon low in the sky also looks red. The Moon reflects sunlight rather than making its own, but the principle is the same. It is also why our sky appears blue in the daytime. Since air molecules scatter light in random directions, it sometimes will scatter a photon that wasn’t heading your way back to you. Since blue light is most likely to be scattered, that scattered light is most likely blue. Hence the sky appears blue because of all the blue light scattering in the atmosphere. This same effect occurs in astronomical observations. In astronomy it is known as interstellar reddening. The space between us and the stars is not empty, but contains trace amount of hydrogen as well as dust and other gases. As the starlight travels light years to reach us, a small amount of the starlight is scattered off the hydrogen and such. Since blue light is scattered more than red, the starlight we see can appear more red than it actually is. Just to be clear, this interstellar reddening is not the same as the more commonly known redshift of light from distant galaxies. Interstellar reddening appears a dimming of the blue end of the spectrum. If we look at the spectrum of a star, we can see that the blue is not quite as bright as expected, since some of the blue light scattered. Hence the star appears brighter in the red than expected. With the Doppler redshift, the entire spectrum is shifted toward the red a bit. This includes things light absorption lines from particular gasses in the star’s atmosphere. Observationally the two effects are very different. So really, quantum physics is why see a red dawn. Thanks for this very clear explanation (despite a couple of confusing syntax errors, apparently due to a hasty rewrite). 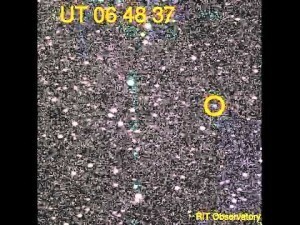 Is differential Rayleigh scattering why infrared and radio telescopes allow us to see stars that are hidden by dust at visible wavelengths? Basically yes. In the interstellar medium it is typically dust that blocks visible wavelengths.